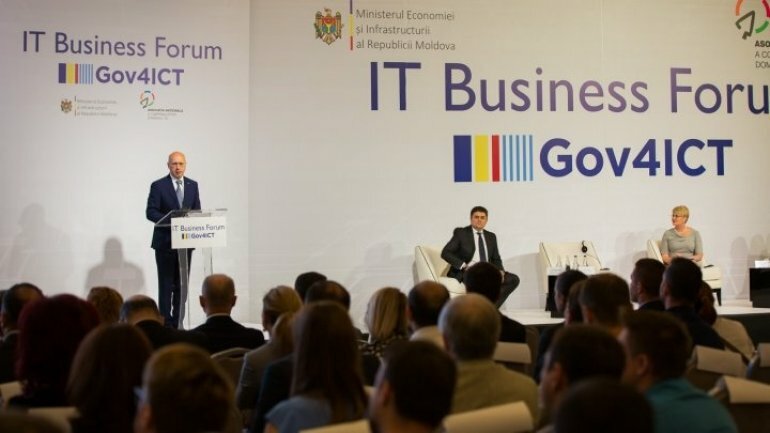 Prime Minister Pavel Filip today participated in the opening of the IT Business Forum "Government for ICT", dedicated to starting the process of creating IT parks in the Republic of Moldova. In his greetings to participants, the Premier declared the government's engagement in implementing reforms in various fields to raise citizens' welfare which creation of IT parks is meant to meet that goal. In other words, establishment of IT parks corresponds to the desired goal of high technology development, offering potential for national economic growth. "The fact that we have moved from the industry era into the information and technology, I'm positive about Moldova growth through the approval of this IT park's creation", Pavel Filip said. Moreover, the Prime Minister emphasized the importance of IT parks in highly competitive regional business environment in which the simplification of administration, business development is deeply appreciated. Finally, the Prime Minister urged all IT companies to put forward proposals on IT parks project, in the meantime, he pledged further support by government toward ICT development, including strengthening the networks of innovation centers and researches. In this context, Tekwill is supposed to be the first step in this approach. The "Government for ICT" Forum is organized by the Ministry of Economy in partnership with the National Association of ICT Companies and attended by representatives of the Government, development partners, as well as over hundred businessmen.